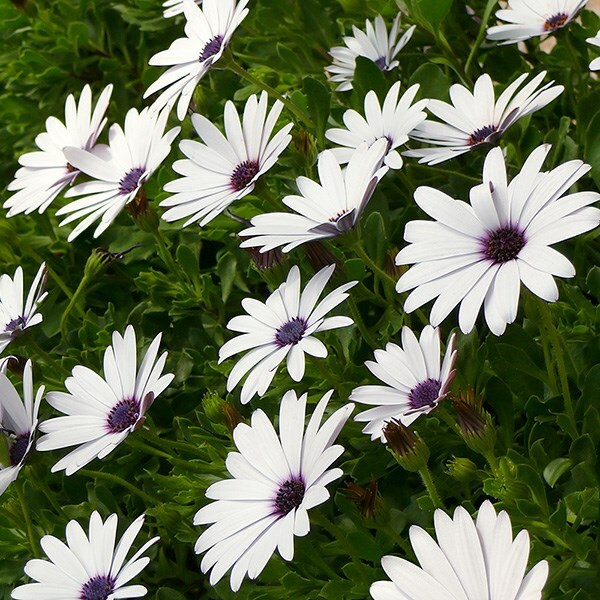 Buy Osteospermum Ice White ('KLEO06123') (Flowerpower series) (PBR) African daisy: Circlet of pure white petals, surrounding a deep blue/purple central eye. Circlet of pure white petals, surrounding a deep blue/purple central eye creates a stunning daisy-like flower produced over many months in abundance. This plant originates from sunny warm climates so grow it in full sun in a well-drained light soil, pinching out any fading flowers to be rewarded with a gorgeous carpet of blooms. planted in a belfast sink and had one beautiful summer. They grew leggy but continued to flower late into the year. Came back well in the spring with new buds appearing - but were totally destroyed by late snow fall.